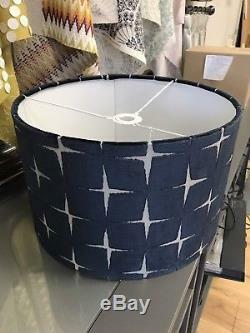 New Handmade Lampshade using Harlequin'Issoria' cut velvet fabric in Opulent Midnight Blue, Lightshade. 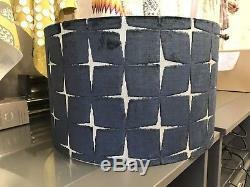 Of glamour to your home with this cut velvet lampshade. All of my lampshades are handmade to order in a variety of sizes suitable for a table/floor lamp base or a ceiling pendant. The shades feature a single seam and rolled edges. 20cm drum: 20cm diameter, 18cm high. 30cm drum: 30cm diameter, 21cm high. 40cm drum: 40cm diameter, 25cm high. Please select whether you require a table/floor lampshade or a ceiling pendant, so that I can ensure that the fabric pattern will be the right way up. Please note that the pattern placement may vary slightly as each lampshade is handmade to order. Each one is therefore completely unique and may differ to that shown in the photo, however utmost care is taken to ensure the best pattern placement. (Please note that this listing is for the lampshade only, and does not include any other items shown in the photograph). The lampshade has been lined with flame retardant PVC which is fully compliant with the glow wire tests carried out by The Lighting Association. Each lampshade is provided with a euro ring to accommodate both UK and European fittings. Low energy light bulbs are recommended (40 watts or less). Please don't hesitate to contact me with your enquiries. 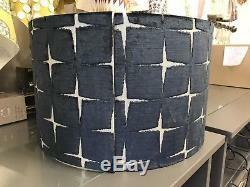 The item "Handmade Lampshade Harlequin'Issoria' Opulent Midnight Navy Blue Velvet Fabric" is in sale since Thursday, January 25, 2018. This item is in the category "Home, Furniture & DIY\Lighting\Lampshades & Lightshades". The seller is "terasa2006" and is located in Bourne. This item can be shipped to United Kingdom, Austria, Belgium, Bulgaria, Croatia, Cyprus, Czech republic, Denmark, Estonia, Finland, France, Germany, Greece, Hungary, Ireland, Italy, Latvia, Lithuania, Luxembourg, Malta, Netherlands, Poland, Portugal, Romania, Slovakia, Slovenia, Spain, Sweden, Australia, United States, Russian federation, Canada, Brazil, Japan, New Zealand, China, Israel, Hong Kong, Norway, Indonesia, Malaysia, Mexico, Singapore, South Korea, Switzerland, Taiwan, Thailand, Chile.